‘I met Trump once,’ chuckles Eva Jiricná tantalisingly at the end of our interview. An architect honoured with an abundance of prestigious awards – from CBE, RA onwards – and known globally for her meticulously detailed interiors and exquisite highly engineered staircases, Jiricná is disarmingly modest and doesn’t name drop to boast. She mentions the President of the United States only because the story is linked to one of the many Joan & David shoe stores Jiricná has designed over the years. Stylishly elegant, Jiricná’s diminutive frame and apparent fragility are deceptive. She exudes a vigorous energy, stamina and steely determination that is inspiring. It is amazing therefore to learn that Jiricná is now 79, but unsurprising that she shows no signs of slowing down. However, she has eased off a little by passing the baton to her former associate Georgina Papathanasiou, the founder of Jiricná’s new London practice Atelier A&D [Jiricná is an honorary director]. Jiricná continues to run her Prague office AI-Design. For more than 20 years Jiricná has divided her time between London and Prague, which she confesses has been difficult. 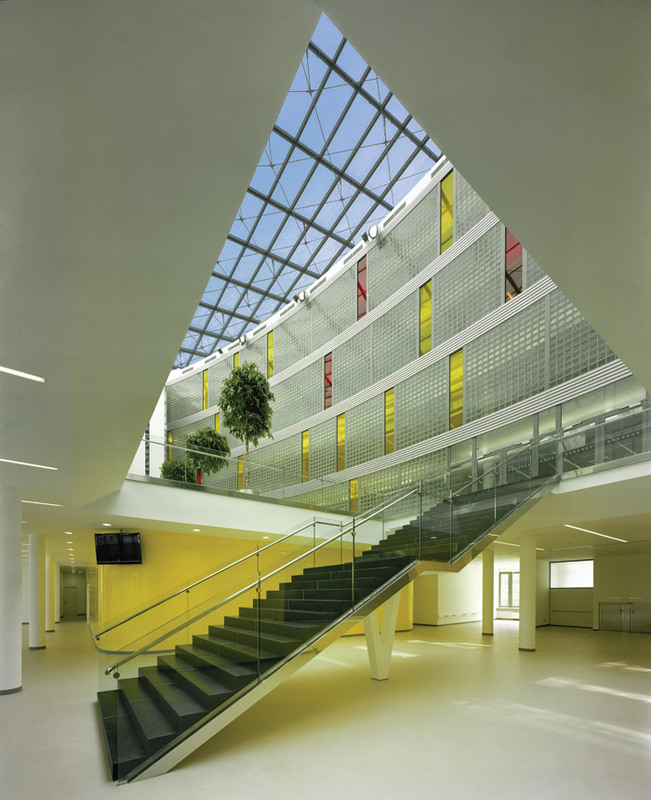 Interestingly, most of the projects in her birth country have been new build, like the Orangery at Prague Castle, the uber-stylish Hotel Joseph and, in her home town of Zlin, the recent library building for Tomas Bata University and the Cultural and University Centre. Jiricná seems unperturbed by the fact that she is often mistaken for being an interior designer rather than an architect; she is more famous for her innovations in shop design and pioneering staircases rather than for her buildings. ‘You know, I don’t give a damn,’ she laughs. ‘I don’t do things to be famous, I do things because I enjoy doing them and because it makes sense. I’ve had a good life and met lots of people I’ve worked with and worked for and from whom I’ve learned a tremendous amount. It’s incredible to think that Jiricná’s career could have easily taken a different path. A passion and aptitude for chemistry meant that Jiricná was determined to become a scientist. But a mix-up in subjects meant she couldn’t study chemistry at university, only physics. In spite of a talent in this other science, her heart wasn’t in it. Then a friend suggested architecture. She says she wasn’t influenced by her architect father, although he did teach her how to draw and she treasures his advice. Jiricná did qualify as an architect in Communist Czechoslovakia and she also become an architect’s wife. However, the marriage ended soon after Jiricná joined her husband in London in 1968 for a work placement at the Greater London Council (GLC). And as Jiricná has proved throughout her long and productive career, her father had no need to be concerned about any lack of success for her as an architect. She adds that she remains fascinated by science and still reads Nature magazine. Soon after Jiricná’s arrival in Swinging Sixties’ London, the Soviet tanks rolled in to her home country in 1968, signalling the end of the Prague Spring and making it impossible for Jiricná to return to her homeland. The work at the GLC began to dry up, although she says that the council probably would have kept her on. ‘I needed money to live because I was supporting my brother [he also happened to be in England before starting university in Czechoslovakia and couldn’t return either], I needed to pay for my bedsit and I wanted to learn,’ says Jiricná. After a number of interviews, Jiricná landed a job with the Louis de Soissons Partnership. She recalls her interview with the senior partner David Hodges: ‘David asked me if I knew anything about modern architecture and I said, I hoped so because this is why I came to England. He then said, that was really good because he hated it!’ Jiricná stayed with the practice until 1979. She largely worked on the ambitious Brighton Marina project, which she describes as “a tremendous learning experience” and one of the most challenging and exciting projects she’s ever been involved with. “I went from a person with zero experience to the key person in the practice who brought in other architects, now famous in their own right, such as Peter Cook, Christine Hawley and Ken Yeang,’ she says. 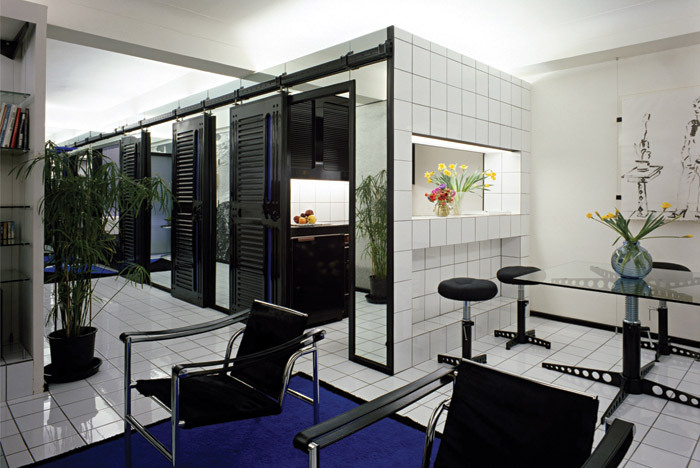 Soon after Jiricná left de Soissons, a chance meeting with two key individuals, namely Coco, who at the time was married to fashion legend Joseph [Ettedgui], and architect Richard Rogers, led to a particularly creative period in Jiricná’s professional life. From this small commission, Jiricná then designed a flat for Joseph in Sloane Street in parallel with a Joseph shop in South Molton Street. Both projects were an immediate hit and gave Jiricná the confidence to tackle interiors. Scores of Joseph shops followed, including the high-profile Brompton Cross, which was the first of the bigger Joseph stores. 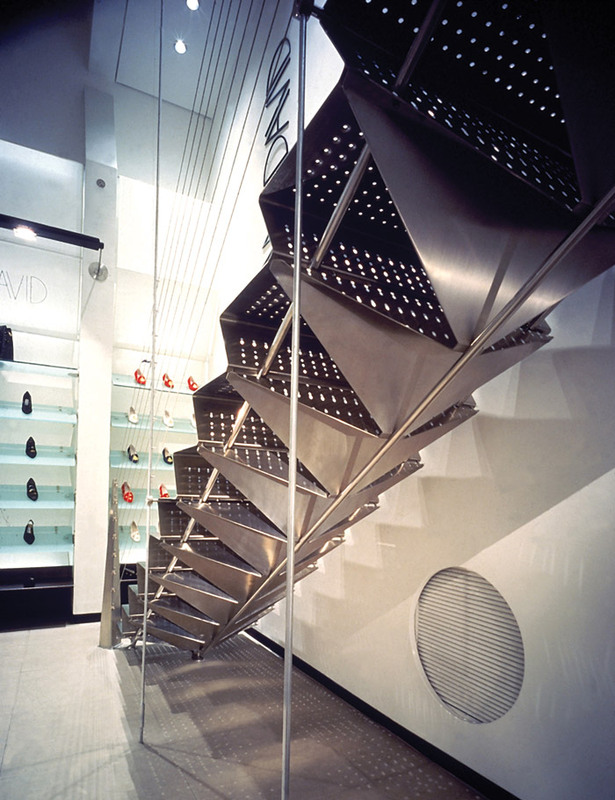 It was also where Jiricná designed the first of her many signature glass staircases, the material being a strong favourite of hers. ‘Joseph cried with happiness when that shop opened because for him to be this little guy who had started cutting people’s hair in the King’s Road to eventually buying a Conran shop, well, he felt he had made it,’ says Jiricná. Brompton Cross was also where Jiricná introduced the wildly popular craze for Italian polished plaster finish. The idea for this wall finish emerged because Joseph wanted an opulent Italian palazzo aesthetic for the shop. Jiricná discovered an Italian former film director who had turned his hand to doing traditional Italian fresco, using marble powder with different textures and shades of colour added. Alongside the shops, including Harrods’ Way-in department and other private commissions, Jiricná ventured into the world of nightclubs, designing Covent Garden’s Browns and the Eighties’ Legends. The latter is another of Jiricná’s favourite interiors. It includes a staircase she collaborated on for the first time with structural engineer Tim Macfarlane, whom she loved working with. Jiricná also branched out into the demanding field of galleries and museums, most notably the Bollinger Jewellery Gallery at the V&A Museum, which she is currently updating 10 years on, and the stunning Tiffany Gallery at the New York Historical Society Museum & Library, completed last year. 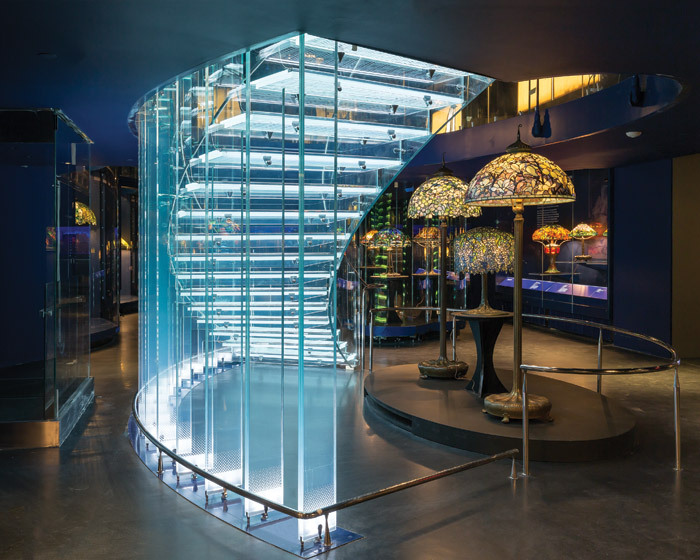 The gallery features a crafted glass staircase that is, to date, Jiricná’s most technically daring, she says. Despite confessing that she is a terrible businesswoman, there’s no doubt that her work has influenced a generation of architects and designers. Asked how she feels about this accolade, Jiricná answers with a characteristic shrug and modesty: ‘That’s very difficult for me to say. I’ve been criticised for being too fussy on detail, but an attention to detail can resolve so many aesthetic problems and can create an interesting interior. 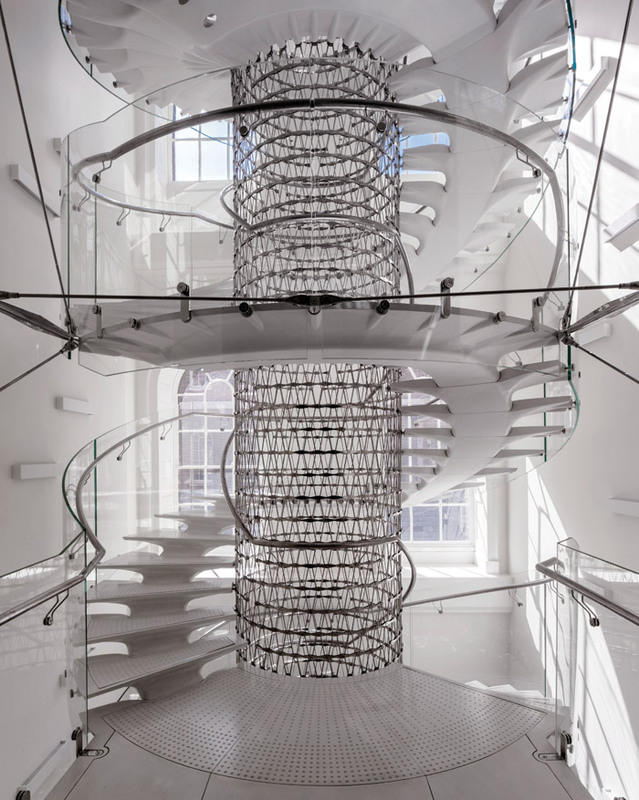 I know people have been influenced by my staircase at Somerset House because the person who made it has had many enquiries, and when I started doing glass staircases lots of people started doing them too. Then, almost as an afterthought, Jiricná adds she would like to be remembered as ‘somebody who tried, and who loved doing what she’s been doing’.